Corby Town and Desborough Town were both knocked out of the NFA Hillier Senior Cup last night (Wednesday). A much-changed Steelmen line-up suffered a 4-0 defeat to Vanarama National League North side Brackley Town in their quarter-final clash at Steel Park while Ar Tarn went down 2-0 to Brackley Town Saints at the R Inn Stadium. 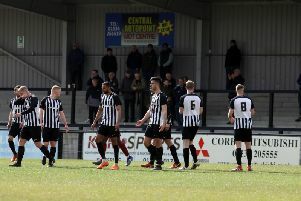 Corby boss Steve Kinniburgh rang the changes ahead of his team’s big Evo-Stik League South Division One Central clash at Peterborough Sports this weekend. And goals from Gareth Dean, Daniel Nti (2) and Shaun Jeffers sent Brackley through. Kinniburgh said: “We gave an opportunity to a few of the boys who have been on the fringes and I thought two or three of them made a point and showed they are pushing for the starting 11. “They came here with a strong squad and I thought we competed but we lost three set-pieces, which is a bit disappointing. The two Brackley sides join Cogenhoe United and AFC Rushden & Diamonds in the last four of the competition.